Canada's foreclosure system is quite unique and significantly different from the process used south of the border in the United States. In fact, the entire home loan structure in Canada is different from that in the U.S. For example, 30-year fixed rate mortgage loans are not available to Canadian homeowners. But despite this, mortgage default rates are significantly lower in Canada when compared to the U.S. According to the S&P/Experian Consumer Credit Default Indices, 0.84% of first mortgage holders were in default in the United States in early 2016, with many major cities such as Chicago, Dallas, New York and Miami well over 1%. Meanwhile, in Canada, the default rate was just 0.28%, totaling just over 13,200 mortgages in all. In fact, the Canadian mortgage default rate hasn't risen above 1% since 1996. With figures such as these, it's clear that Canada's foreclosure rate is significantly lower than the rate in the United States, but there are still many great opportunities for American real estate investors, particularly when the exchange rate is favorable as was the case in 2016. In the Canadian foreclosure system, homeowners have two basic options when facing financial challenges. One option is called power of sale, while the other is known as a judicial foreclosure. The latter option is only available in five regions. So the process does vary quite significantly depending upon the borrower's location. Notably, the system in Canada is significantly more friendly to lenders and creditors, who have the ability to attach all of the borrower's assets, in addition to the piece of real estate in question. Compare to the U.S., where many states do not permit this and in states where lenders can pursue other assets, the process is considerably more complicated and generally more in favor of the consumer. What is Power of Sale in the Canadian Foreclosure System? In the Canadian foreclosure system, the term “power of sale” refers to a more informal process that does not typically involve the court systems as is the case for a judicial foreclosure. Power of sale refers to a more informal process that does not typically involve the court systems as is the case for a judicial foreclosure. The process begins when an individual falls behind on their mortgage payments. After a certain timeframe, they will receive a notice, alerting the borrower that they have a period of 35 days to get current on their mortgage payments. If this is not possible, then the lender will dispatch a process server with a Statement of Claim for Debt and Possession. The homeowner has a 20-day timeframe to issue a response, formally known as a Statement of Defense. If the Statement of Defense is not filed, the lender will typically receive a default judgment in which they receive a Writ of Possession. This enables the bank to proceed with the eviction process. Ultimately, in a power of sale transaction, the lender ultimately secures the ability to foreclose upon and sell a property. But in the case of a power of sale foreclosure, if the sale price of the real estate exceeds the amount owed, you will receive the difference. This is not the case for a judicial foreclosure, where the lender keeps any and all proceeds. A power of sale proceeding is considered an adverse credit history item that remains on the individual's record for a period of six years. What is Judicial Foreclosure in the Canadian Foreclosure System? As the term suggests, judicial foreclosure in Canada involves the court system. In a judicial foreclosure, a certificate of foreclosure and the ownership of the real estate is transferred to the lender. As part of this process, the borrower surrenders any and all claim to the property and the proceeds from a sale of the property. Therefore, if a Canadian borrower owed $50,000 on a home and the lender takes possession of the property via judicial foreclosure, then sells the property for a sum of $75,000, the lender gets to keep the full amount. The borrower loses any claim to the $25,000 sum that was above and beyond what was owed. Judicial foreclosure is regarded as a more intensive, time-consuming court-based option that allows a lender to recoup and recover the borrower's property. On average, once the judicial foreclosure process gets underway, it takes around five to six months for the process to reach completion. Notably, just like in other areas of the world, like the United States, there are additional pre-foreclosure timeframes that apply in many provinces before the judicial foreclosure process can be started. The pre-foreclosure process can take as long as ten additional months in some provinces. In Canada, a judicial foreclosure remains on an individual's credit report for a period of six years. Judicial foreclosure is not available in the other five Canadian provinces and Canada's three territories, including the Yukon, Prince Edward Island, New Brunswick, Ontario, Newfoundland and Labrador, Quebec, Nunavut and the Northwest Territories. In regions such as Ontario, Newfoundland, Prince Edward Island and New Brunswick, a power of sale liquidation process – typically with just minimal involvement by the courts – is utilized instead of judicial foreclosure. 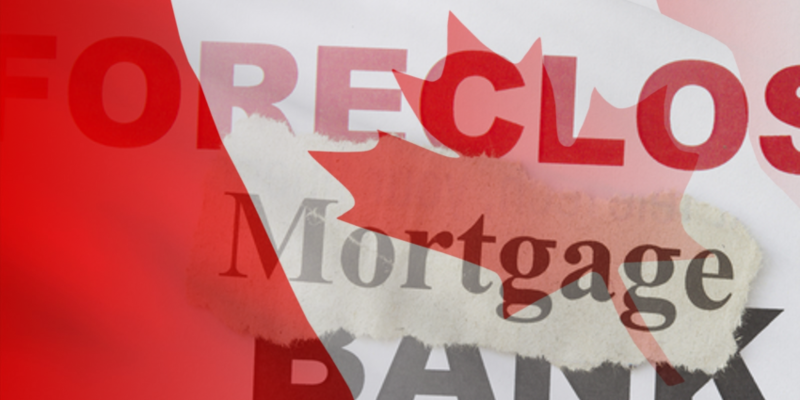 In all, Canada's foreclosure system is quite a bit more lender-friendly than the process used in the U.S. While there are allowances for a process similar to an American short sale, these proceedings are far less common in Canada because Canadian lenders are permitted to pursue other assets, in addition to the real estate in question. Therefore, if a homeowner's house was sold, but there was still a $20,000 balance owed to the lender, the lender would be free to pursue other assets, such as another property, a boat, cars and bank accounts. Canadians can opt to purchase mortgage default insurance to prevent a lender from pursuing other assets. In cases where an individual does not have other assets, the lender may seek other remedies, such as wage garnishments.